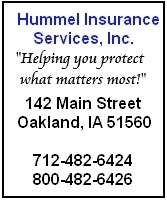 JUNE HOLLIDAY, 82, of Atlantic died Nov. 16th, at the Cass County Memorial Hospital, in Atlantic. A Celebration of Life Memorial service for JUNE HOLLIDAY will be held at Noon, Saturday, April 13th at the Atlantic Golf and Country Club. 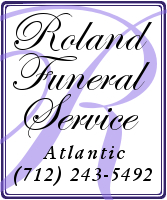 Roland Funeral Service of Atlantic has the arrangements. The family invites those who loved June to share a few words or a little story. Online condolences may be left at www.rolandfuneralservice.com. Her son – Richard (Regina) Hallenland, of Broadview Heights, OH. 5 grandchildren and 6 great-grandchildren.